FIERCE is a hip-hop dance team. FIERCE stands for Flawless, Intense, Energetic, Radiant, Crunk, Exposed. This dance team prides itself our creativity, originality, and diversity among its members. All types of dancers are welcome at any skill level. FIERCE performs at Oktoberfest, Spring Weekend, basketball games, and other performances as well. 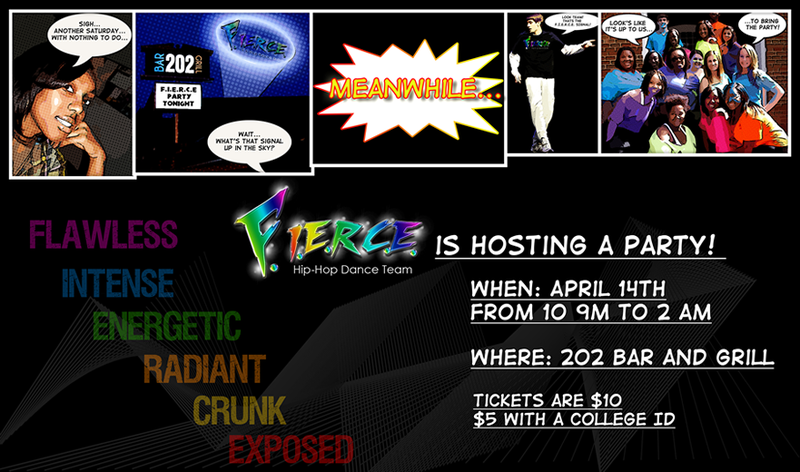 The purpose of FIERCE is to provide an outlet for talented dancers, as well as serve as entertainment on and off campus. This event fell on the week of Spring Weekend, an annual event held at Longwood University that brings musical acts and a carnival-like atmosphere to the campus. This years theme for Spring Weekend was superheroes and the initial concept was a superhero themed poster to coincide with the Spring Weekend theme. I decided that there was no better way to transform the team into super stars than by making them the stars of their very own comic. I utilized a series of filters and masks in Photoshop to create the comic book like effect on several photos of the team, complete with their own signal in the sky.